Now we just need more evidence. Ever since fast radio bursts (FRB) — or “cosmic whistles” — were discovered in 2007, they have become one of the most mysterious sounds our universe produces. FRBs generate as much energy as the Sun does in one day, except they do so in a matter of milliseconds. What makes them more bizarre is that, despite many attempts, scientists still can’t quite figure out where they come from. For more than a decade now, there have only been a little over a dozen FRBs detected. These seem to be as sparse as they are as brief. The difficulty lies partly in how FRBs can be detected. So far, it’s only possible using radio wave emissions caught by radio telescopes — that is, until recently. 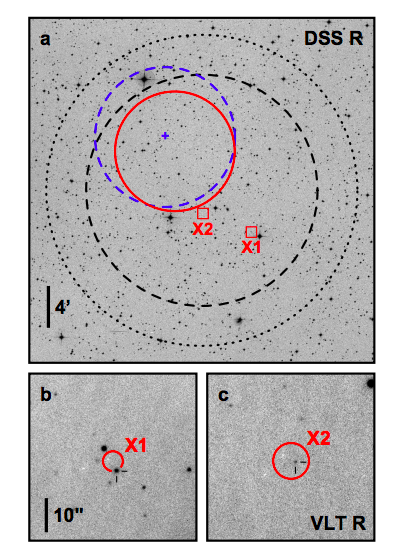 In a study published in The Astrophysical Journal Letters, James DeLaunay and a team from Pennsylvania State University reported that they caught a transient gamma ray counterpart to an FRB. FRB 131104 and its accompanying gamma-ray. Credits: DeLaunay et al. The FRB was discovered on November 4, 2013, and quite by chance. That day, NASA’s Earth orbiting Swift satellite was aimed at a patch of sky which happened to be the target of the Parkes Observatory, a radio telescope in Australia. Parkes recorded the FRB, while Swift detected a gamma-ray burst at the exact same place and time — something DeLaunay later realized. The gamma-ray bursts outshone the radio emissions more than a billion times, and lasted about two to six minutes, far longer than the accompanying FRB’s milliseconds. This provides a huge clue about how FRBs are generated. It also supports the idea that FRBs happen during the black hole-forming collision of two neutron stars. “The problem is that no existing models predict that we would see an FRB in these cases,” researcher Derek Fox explained. Clearly, there’s a lot we don’t know about it yet. But this is a step forward, to be followed by finding other evidence of such an occurrence. We are slowly getting a better understanding of the complexities of our universe.